Most of Indian Taxpayers irrespective of their earnings are indulged in Share trading because it is seen as a quickest way of earning handsome money. Also trading becomes easy with the rapid development in technology. Thus it becomes necessary to know the taxation on the earning from share trading. Identifying of transactions as trading transaction or as investment is not an easy task. To alleviate this difficulty CBDT had issued Circular No.4/2007 dated 15.06.2007 which was in continuation of the Instruction No. 1827 issued by CBDT on 31.08.1989. CBDT in its circular has taken views of the Hon. Supreme Court in CIT (Central), Calcutta Vs. Associated Industrial Development Co. (P) Ltd. (82 ITR 586) and C.I.T., Bombay Vs. H. Holck Larsen (160 ITR 67) and the Ruling made by the Authority for Advance Rulings in the case of Fidelity North Star Fund and others ? 288 ITR 641. In the above case, Authority for Advance Ruling laid down the principles for deciding a transaction in shares, to be classified as trading activity or an investment activity. The significant nature of transactions, the manner of maintaining books of accounts, the enormity and ratio between purchase and sales and the holding period would furnish a good guide to determine the nature of transactions. Ordinarily the purchase and sale of shares with a motive of earning profit, would result in the transaction being in the nature of trade/adventure in the nature of trade; but where the object of the investment in share of a company is to derive income by way of dividend etc. then the profits accruing by change in investment (by sale of shares) will yield capital gain and not revenue receipt. The circular also recognizes the possibility of tax payer to have two portfolios, i.e. an investment portfolio comprising of securities which are to be treated as capital assets and trading portfolio comprising of stock-in-trade which are to be treated as trading assets. When an assessee has two portfolios, he may have income under both heads, i.e. capital gain as well as business income. In the light of this circular we shall understand how the income from share transactions is to be taxed as capital gain or business income. If you do not frequently buy and sell shares than all the gains from share trading is to be assessed as capital gains and the dividend received shall be assessed as Income from other sources [currently exempt under section 10(34)]. If you have held shares for more than 12 months before selling then the gains earned shall be treated as long term capital gains which are to be taxed at the rate of 20% u/s 112. In case you have sold the shares through recognized stock exchange by paying STT (security transaction tax) than this LTCG is exempt u/s 10(38) and no tax shall be payable. On the other hand if the shares are sold off market then 20% tax becomes payable on the gains earned. To prove the gain as long term capital gain, you can attach the contract notes for the buy/sell trades and the DEMAT statement which shows the credit/debit of shares, if required. In case you have sold shares within 12 months of buying then the gains earned shall be treated as short term capital gains which are to be taxed at the rate of 15% u/s 111A. In case there is long term or short term losses, the same can be carried forward for 8 years. The short term capital loss can be set-off either against short term or long term capital gains from any source but long term capital loss can only be set-off against long term capital gains from any sources. Also remember that long term capital losses occur for shares where STT is paid cannot be carried forward for future set-off. Read: Mutual Funds guide for Beginners? Normal Trader means a person who does trading in shares but not on day to day basis as intraday trader. Normal Traders buy shares, take delivery and then sell it to book profit or gain. Normal Trader can also be categorized as an Investor but there is one major difference between normal trader and an investor i.e. Normal Trader holding period of shares is always short-term while holding period of shares in case of an investor could be long-term as well as short-term. Apart from this difference, both normal trader and an investor are same in all aspects. Both take delivery before selling but a point to remember is that in case normal trader who shows shares under stock-in-trade shall always be assessed under the head of Income from Business even he takes delivery of shares. Read: How to increase your Mutual Fund Return? 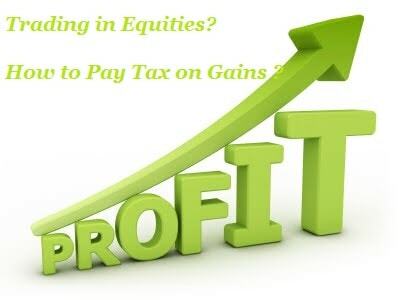 Taxation on the profits earned from Intraday trade is the most asked question by any trader since income tax in this case is not clear as under which head it should go and what tax rate should be taken to ascertain the tax liability. Section 43(5) of the Income Tax Act, 1961, defines Speculative transaction as a transaction in which a contract for purchase or sale of a commodity including stocks and shares is periodically or ultimately settled otherwise than by actual delivery or transfer of the commodity or scrip. Any profit or gain earned from day trading is called Speculative Income (either Speculative Profit or Speculative Loss). Any person, engaged in intraday trading is automatically treated as someone who is trading in shares as business, thus his income shall be assessed as Income earned from Business and Profession and tax rate shall be same as any other business activity. Speculative losses can be carried forward for the next 4 years provided taxpayer has declared the same while filing the tax return and net off only against any speculative profits over the next 4 years. All derivatives trading activities done through recognized exchange are not considered as speculative income like in intraday trading.? Hence any profit or loss arising from derivative trading is treated as arising from business activity. In case of trader who trades in derivatives and also buy shares and receive delivery, can claim short-term capital gain for money made in shares for which he receives delivery in his DP and claim income/loss from derivatives trading as business income/loss. Read: All you need to Know about Arbitrage Funds? The profit/loss is assessable as Capital Gains if shares are held as capital assets i.e. investments. The profit/loss is assessable as Business Income if shares are held as stock-in-trade. The Profit/loss is assessable as Business Income. The Profit/loss is assessable as Speculation income/loss. The Profit/loss is assessable as Business Income if commodities are held as stock-in-trade. The Profit/loss is assessable as Capital Gains if commodities are held as capital assets i.e. investments. I have a query… If I reinvest all my day trade profits in a long term portfolio how will the tax be calculated? I have some share on which I have loss, i think this share will never get even break-even value. According to you article It seem that I will not able to get even tax benefit of loss. But some where I have read that I share are sold off-market. Gain/Loss from such sale can be offset again other long term gain or loss. Kindly let me know as such provision is available or not.